Do I want to go to the flea market? Silly question. I love going to the flea market. It’s getting outside and also finding some fun treasures. I used to look for items to sell on my Etsy shop but I’ve kind of downsized in that and am looking for items to give as gifts or to use myself. And being that Christmas is coming, it’s great to find some treasures. Well, I hit pay dirt today. I didn’t spend very much money at all…there are dollar tables which I always look at. My one girlfriend gets annoyed at me when I consistently look at the dollar tables…but, that’s what is fun for me. 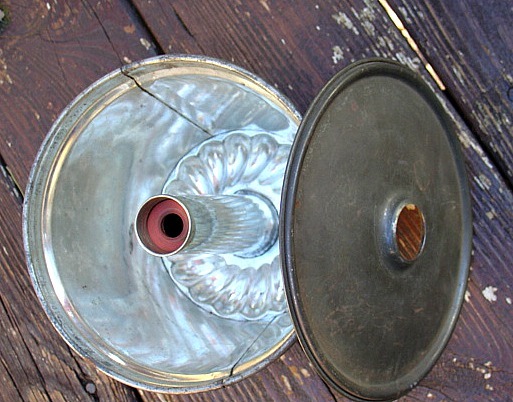 Today I found an vintage English pudding mold…since I am married to a Brit, I have always wanted to try Christmas pudding…and it’s a particular mold…super excited when I found it today and for $2 as well! Since I have Scandinavian blood(made in USA of Danish parts…), I was also excited to find the wooden Christmas tree to put the little candles in and the Swedish angel chimes….made in Sweden instead of the Made in China ones( do NOT get me started on that charade…). When my daughter was small, she adored the angel chimes. I have a photo of her somewhere where she is adoring the angel chimes. This particular one is heavier than the one I had and I will clean it up and give that to her for her birthday this year as well as the little tree. We had a little tree like that when I was growing up. (her birthday is just before Christmas). 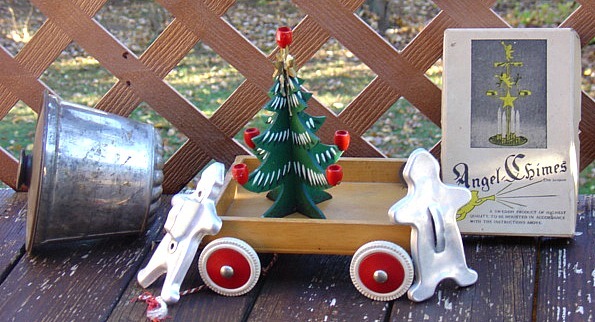 And lastly, I got a really cute wooden wagon that used to hold wooden blocks(made in Germany) and two old fashioned Gingerbread cookie cutters. All for less than $10. I am thrilled. Add to that the day was gorgeous…70 and sun was shining…got my walk for the day in as well. What did hubby buy? A 1948 English penny for twenty five cents! After my parents retired and moved from the bakery, they moved to a country area close by and started going to a small country church. The pastor there became a good friend and he knew how much my parents loved hearing a Danish hymn for Christmas…so, every Christmas Eve this particular hymn would be one of the hymns sung. 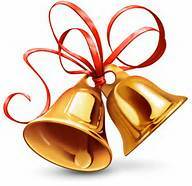 The Bells of Christmas by Grundtvig. I can see my parents’ eyes of sheer delight when the music would start and they would sing together…the Danish lyrics. Like rushing mighty water rolls! Shall swell our jubilee of song. After church service, we would come home, put the tree on, music on and have coffee and a piece of Julekage with butter and jam and just be hygge(cosy) with being together and knowing that it was Julaften, talking about family members still in Denmark and memories of the past.